This weekend was chock full of activities. 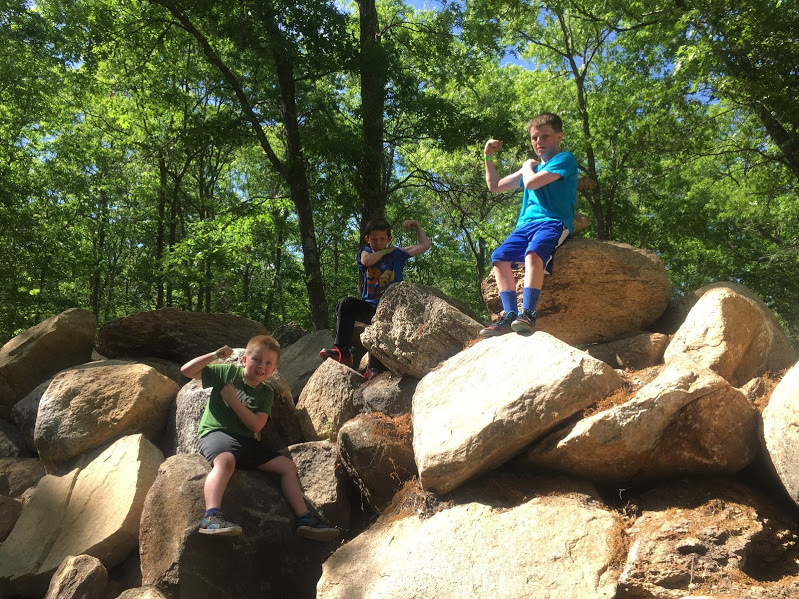 From Infinitus to Spartan Race to a #racelocal event Wason Pond Pounder, you had your choice of what to do. If you weren’t up for a race though, I know that’s near sacrilege around here, there was also an opportunity to check out the Laid Back Forest. 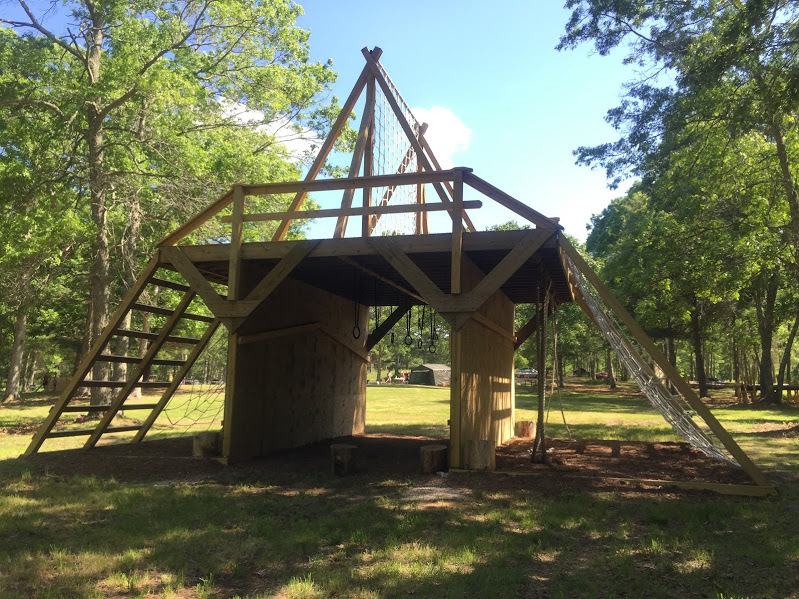 Located in Coventry, RI, deep in the woods of a residential neighborhood, was an adult playground you would not believe unless you were there. I had read the buzz about this place since it opened and had not been able to make it until now. I caught wind that they were holding an open house to kick off the beginning of the warm weather season. They were to open the course up for 3 hours to the public, at no charge, though you did need to get a ticket as they expected to have quite a few people show. 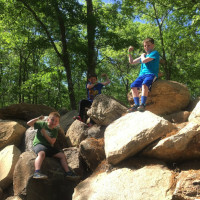 My two boys (Alex and Colin) and their friend (James) thought it’d be a fun excursion so we hopped in the truck and made the two hour drive. As we made our way through rural Coventry we finally saw the sign to turn. We slowly rolled on, trying not disturb the residents, and it came into sight…. We finally made it!!! And it was magnificent, it was epic and we were going to play our hearts out for three hours! As I said, you did have to pre-register but it was quick and easy. Similar to a race you got a wristband and signed the usual waiver. Quick and super easy. From there it was your choice. There was no structured tour, no workout to follow, just an open field of OCR heaven! There were your typical walls of various sizes, a-frames with ropes to grab on and climb over, cargo nets, etc. You had a really cool spear throwing station, with at least 5 spears on ropes, to practice with. 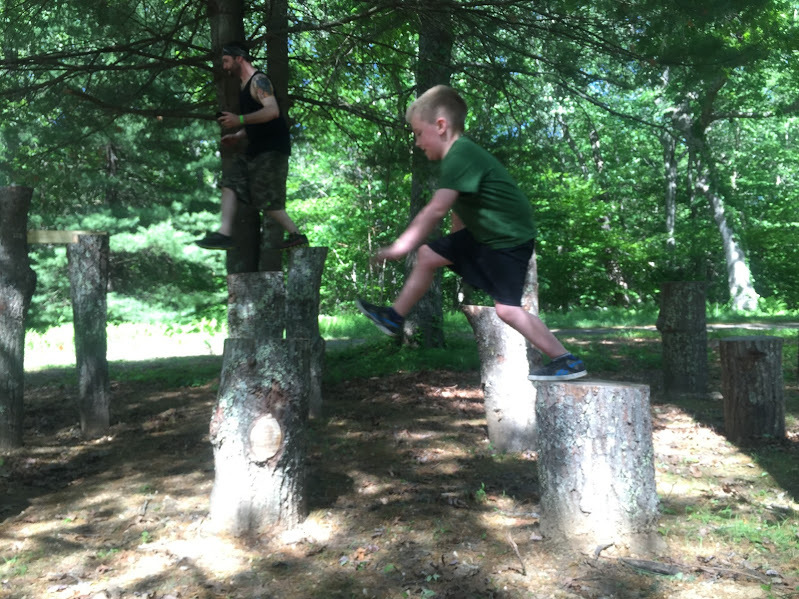 My son Colin and I enjoyed the balance garden which had beams and stumps to balance, jump and climb over. 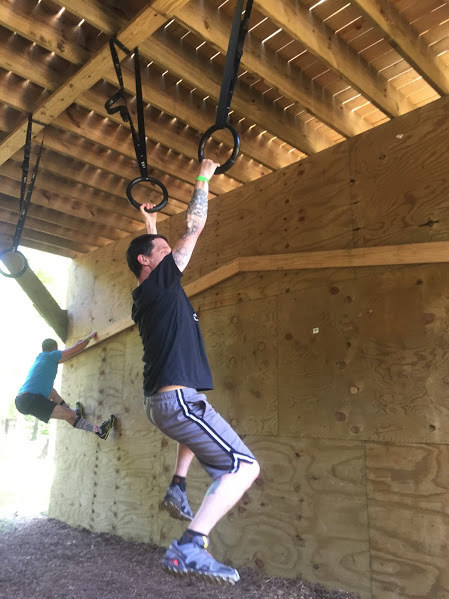 There were monkey bars and even an extremely tall wall similar to the one Robb has at FIT Challenge that you have to climb way up and over. 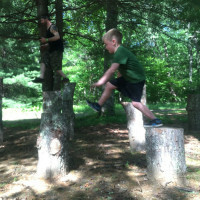 There were some logs of various heights set up similar to walls that you had to jump and climb yourself over. You had a couple inverted walls, of various heights. They got really innovative on one thing which seems more designed for the kids. 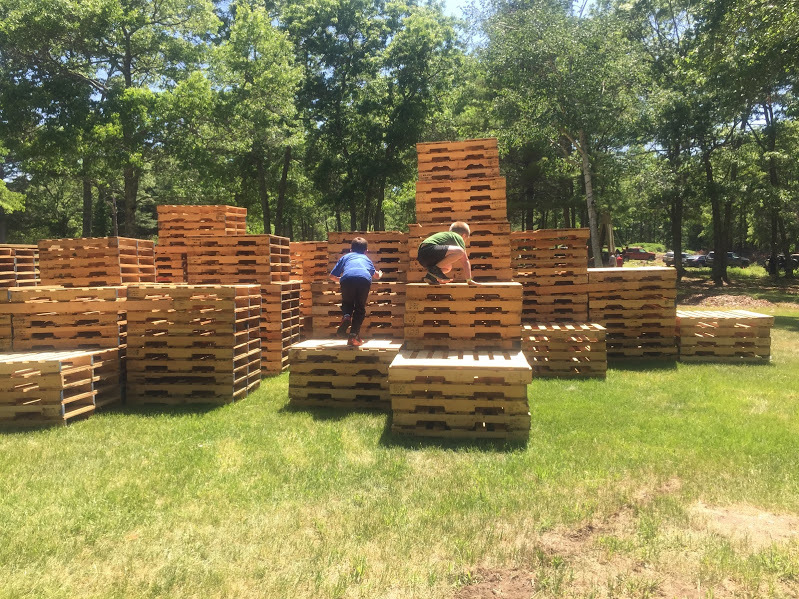 They had stacked tons and tons of wooden pallets together and put them all around a small area. The kids could jump up, down over and across. To be honest, I had to get in on it too, it was loads of fun. 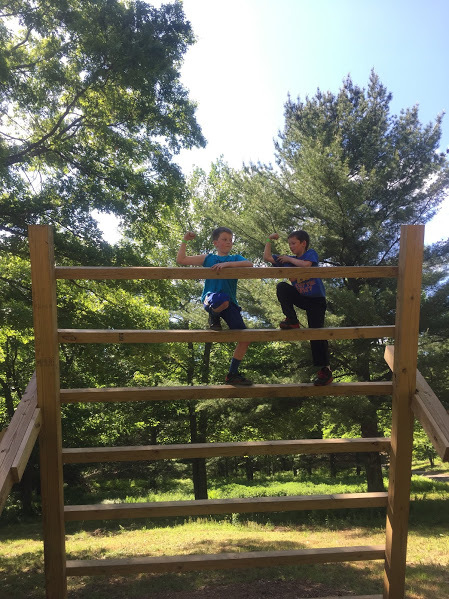 There were also some not so typical obstacles as well that were a lot more ninja warrior oriented. There was an inverted wall, a salmon ladder, a salmon ladder to a wooden plank “monkey bar” jigsaw type of thing. That was extremely intense, I didn’t even attempt that one, it wasn’t happening! 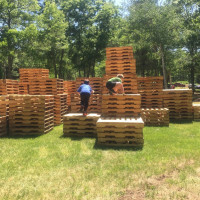 There were the 45degree angle jump pads that you usually see at the beginning of a ANW course, unlike the shows usual 4-6 pads there were seven so you really had to keep the momentum going if you planned on conquering this. I really loved the swinging rings, I’ve seen it a ton of times on tv and have always wanted to try it. Yeah, I nailed it! In the middle of the field though was a gigantic piece of equipment. I’d call is Goliath but that name is taken and honestly, doesn’t come close to the obstacle this thing is. We will just call it the monster, how’s that? It had multiple traverse walls which were extremely difficult. 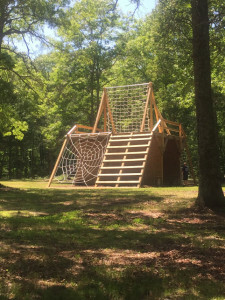 A variety of diameter rope climbs. There were ladder climbs to the top level, including two cargo nets which on was set up like a spiders web. Once up top there was a vertical cargo climb. At its peak it must have been 30-40 feet off the surface of the ground. It was awesome! I know I’m missing a ton here, but that’s the great thing, you can now go and explore it for yourself! There are already talks of trying to do this a couple more times this summer and I surely am hoping we can put together a Spahten excursion, you will all love this place and not want to leave! 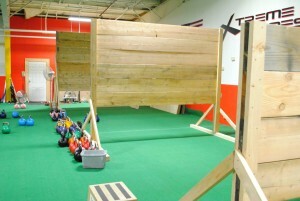 Train180 is a functional fitness facility located in Nashua, NH. 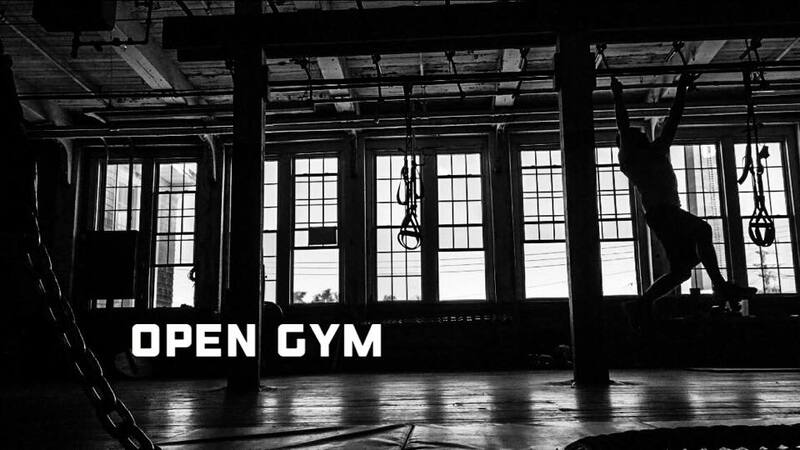 Its owned by certified personal trainer, fellow Spahten, and OCR enthusiast Dave Hooper. They are also an official training facility for the #racelocal Grand Prix. Train180 opened way back in the early years of OCR in 2011, and is located in an old mill and factory section of the city. Though a little hard to find, it’s an ideal space for his setup. 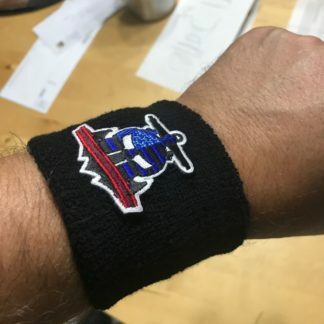 According to Dave, “‘Train180’ comes from the idea of taking someone’s fitness in a completely different direction from what they have been accustomed to. A 180 degree turn if you will. 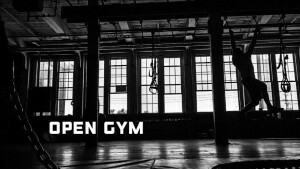 Getting them off machines, out of their comfort zone, and into something new.” This philosophy is apparent as soon as you walk in, as there is only a small section of cardio machines and free weights, and the majority of the large space is open and full of functional equipment and obstacles… an OCR addict’s playground! 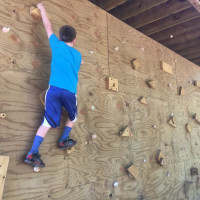 At Train180 you can find almost all of the most common obstacles, including 3 different walls, monkey bars, tarzan swings, tire drag and hoists, sloshpipes, traverse wall, rope climbs, heavy jump ropes and heavy carries. They did a great job utilizing the space and features of the old factory, which added a nice, rugged feel to the facility. 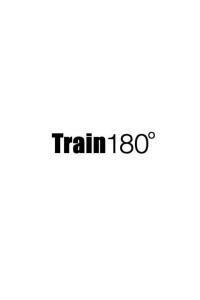 Train180 offers personal and group training, open gym time (with or without a supplied workout), and a few OCR specific classes. They also put on a timed course inside their facility, and in nicer weather incorporate nearby trails. Along with a fellow Spahten, I attended their Saturday, 10:30am OCR class. After a quick warmup, we were set up at different obstacles to begin a rotation. With most stations having duplicate obstacles there wasn’t much back up, despite a pretty good turnout. Our workout consisted of most of the obstacles mentioned along with a few more. Where the workout really shined was in its setup. 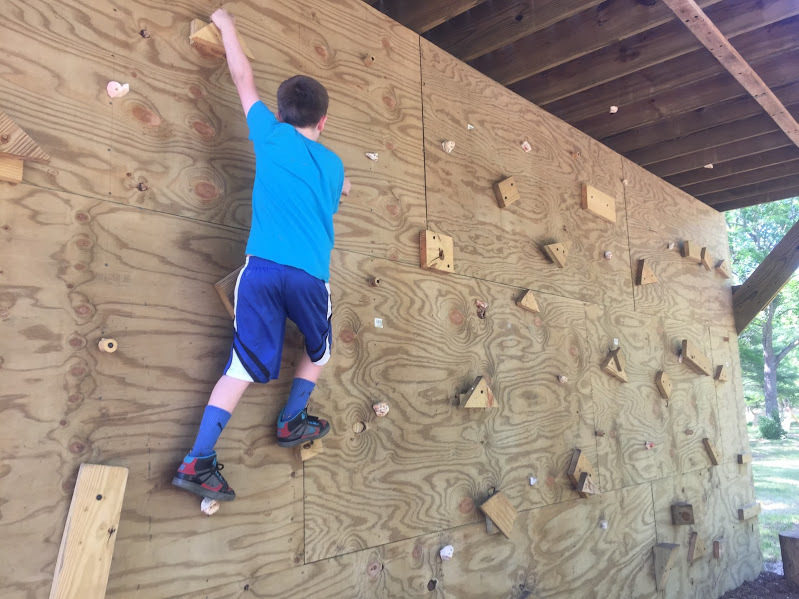 After completing every third obstacle we were forced to tackle a wall, and interspersed throughout were cardio intensive obstacles, including treadmill, jumprope, and stairs. This is a great way to structure a workout, as it closely mimics the race conditions of cardio-obstacle-cardio. Consistent workouts like this should help to improve times for short distance races, per the principle of specificity. Meaning if you want to get better at racing, then at least part of your training should closely mimic, or even match, the specifics of what you are training for (i.e. run to get better at running). To maximize the benefit of this workout, however, does require at least minimal proficiency at the obstacles. 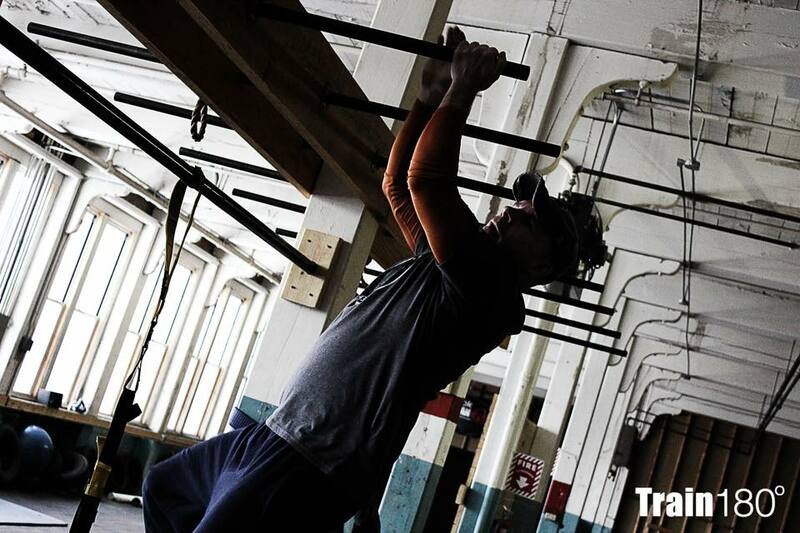 Too much time spent on obstacles you aren’t ready for can sabotage the workout. 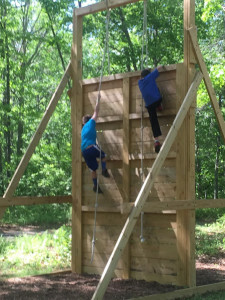 Fortunately, of the obstacles we worked that day, only really the wall, monkey bars, traverse wall and rope climb required much specific skill, which still left about 10 other obstacles and exercises; more than enough to get in a great, effective workout. 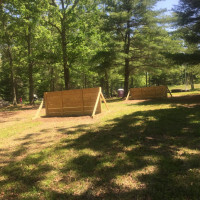 Perfect for simulating race conditions and getting in practice time on obstacles. 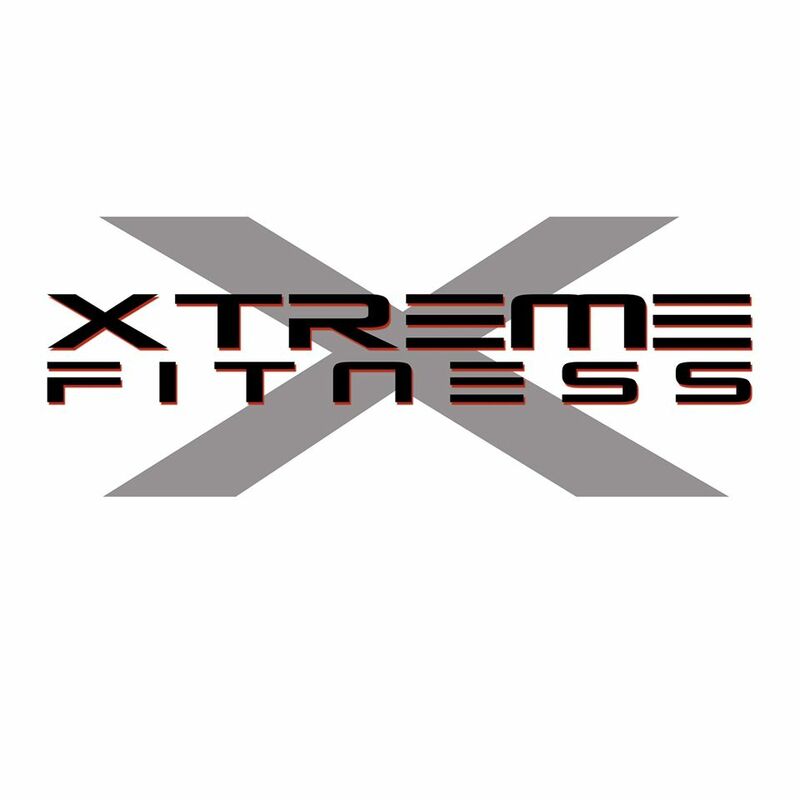 Xtreme Fitness Center is located in Hampton NH, and is owned by fellow Spahten Rob Gagnon. You may remember him for his Spahten WOD posts. 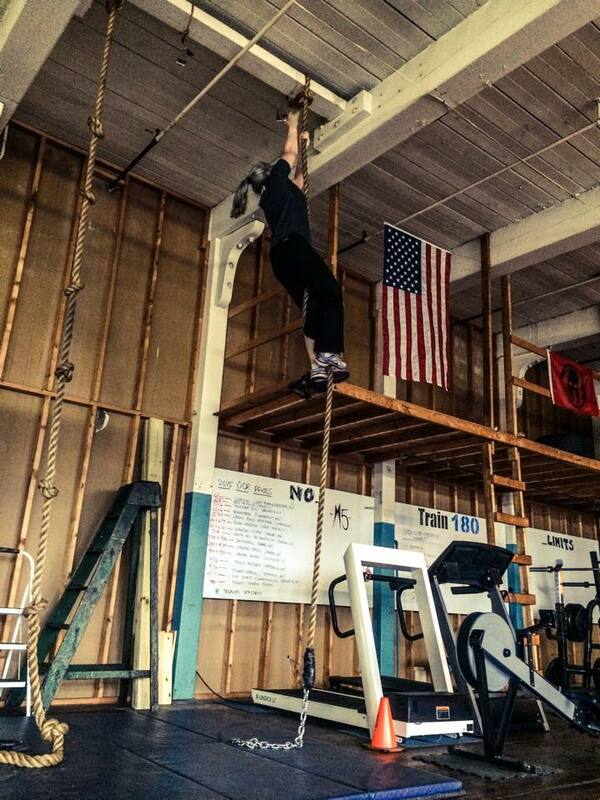 He has multiple credentials, with certifications in Personal Training, Kettlebells, TRX and Olympic Weightlifting. He is also working on his Spartan SGX Certification, and it was at an SGX workshop where I first got to really talk with him. 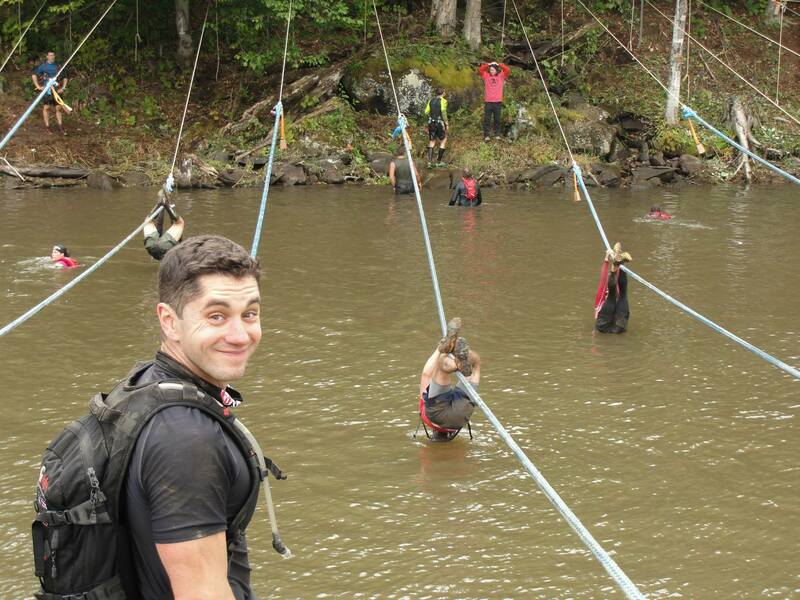 Right off the bat you can tell he is really passionate and knowledgeable about fitness and training, and particularly Obstacle Course Racing. It’s important to me that he is “one of us” (not a Spahten per se, but an OC racer) and not just an opportunist looking to cash in on the current fitness trend. 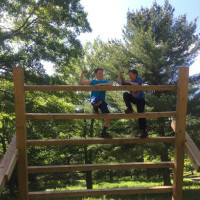 As it’s written in the bio on his site, he “can often be found running, jumping, climbing & crawling all over New England competing in Obstacle Course Races.” First-hand experience of life down in the mud can give you the best perspective on what’s really important to focus on when it comes to obstacle race training (ORT). So why did I start with so much on Rob, and have yet to mention all the cool toys and obstacles he has?? Because cool toys only gets you so far – it’s the knowledge and effort that’s put into designing the programs and workouts that is truly worth something. The facility at Xtreme Fitness is very nice, and is perfectly sized for his needs. There are 6, 8, and 10’ walls, rings, tires, and ropes along with more normal functional gym equipment like pull-up bars, TRXs, kettlebells, barbells etc. (and now spin too for those looking for great crosstraining). 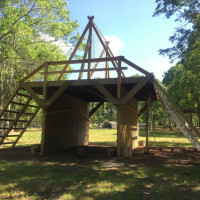 There is also a small outdoor section that’s used in warmer weather, with miles of trails nearby that they will sometimes incorporate into their workouts. 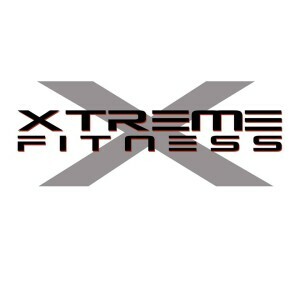 Normal gym routine at Xtreme Fitness revolves around 6-week strength and conditioning programs, including a bootcamp-style class called Xtreme Octane. 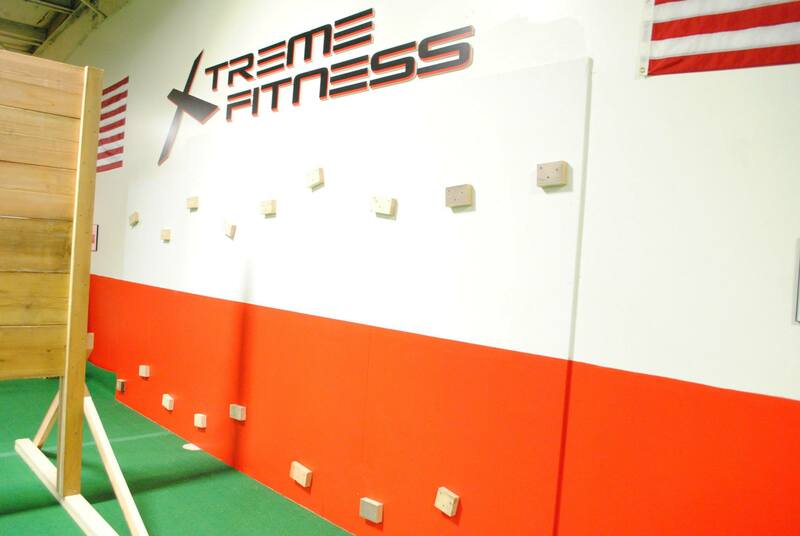 Xtreme Fitness also has Open Gym time when you can come in and practice obstacles or get in the WOD. 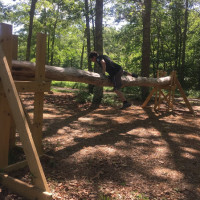 While not OCR specific, Rob does include the use of obstacles in his classes, and focuses on many of the movement patterns needed to build strength for the obstacles (i.e. 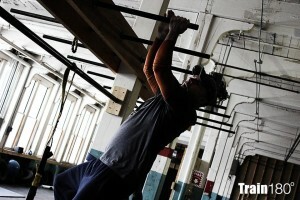 training grip and pull-up movements in order to succeed at monkey bars). 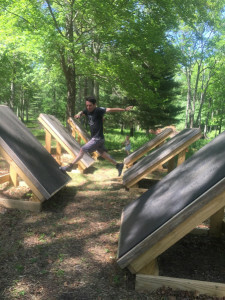 While training on obstacles is fun, unless you are already good at them and are looking to perfect form, it’s the strengthening of movement patterns that will really get you long-term success at those obstacles. In other words, what’s the point of practicing monkey bars if you can’t even get to the second bar? 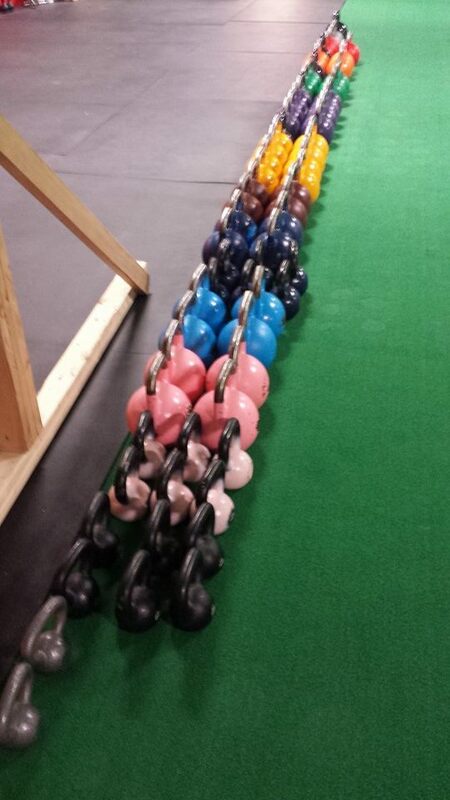 You need to take a step back and build up specific strength first, and this is what Rob’s classes can really offer. One Saturday morning, with a couple Spahten friends, I attended one of his Xtreme Fitness classes. Pre-workout, Rob led us through a thorough warmup and mobility session, which is a nice (and important) touch you don’t always find in bootcamps, too many of which are only designed to make you sweaty and sore. The workout itself consisted of about 8 stations that we rotated through 3 times, and included such exercises as tire flips, bear-to-crab crawls, TRX rows, sledgehammers, and the quad-burning plate pushes. Class then finished off with a core-busting circuit. It was a well-designed class, with all major muscle groups worked and many OCR movement patterns targeted. It was obvious the workout was created with a purpose in mind, which is necessary if long-term effects want to be achieved, and wasn’t just a random bunch of exercises thrown together. 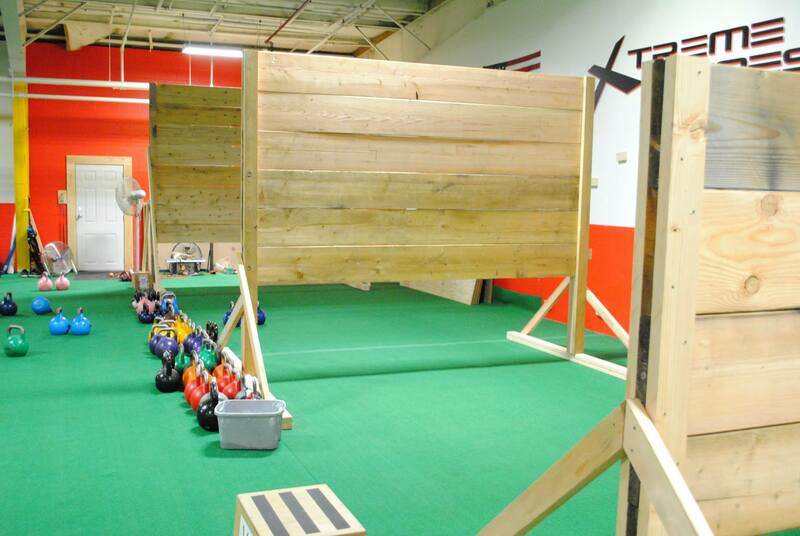 Overall, Xtreme Fitness is an excellent facility with a highly knowledgeable owner, with great offerings for OC racers looking for a better alternative than their normal big-box gym, or those looking to make a field trip in order to get some OCR specific training in. 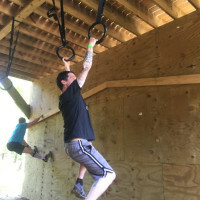 There are plans for more OCR-specific classes and programs coming under the SGX banner, and I’m excited to see what Xtreme Fitness has in store! 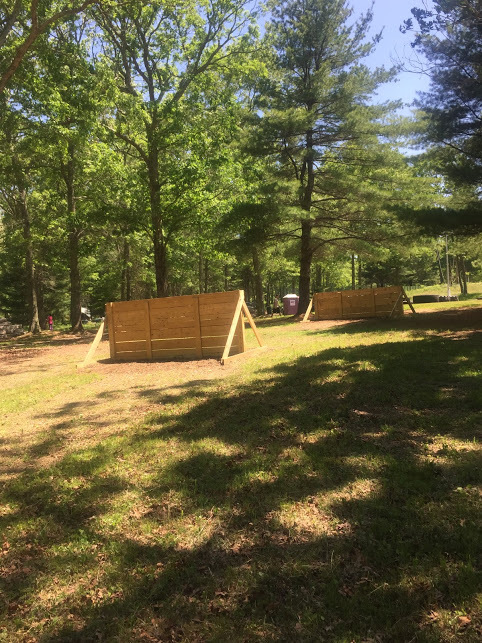 In this new project – Stephen Mello visits facilities in New England that offer obstacle course training or facilities, and lets you know the deal. There are more of them than you may think, and we hope that this series will highlight those near enough to you for a regular visit. This afternoon, we’ll be posting our first, and Stephen will be scheduling time at others soon. 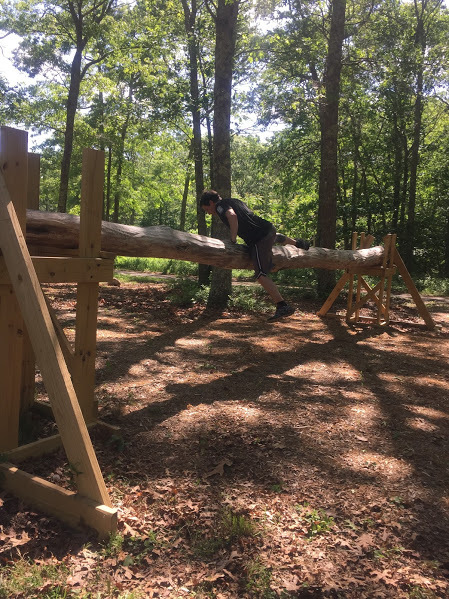 I got started down this koolaid-lined OCR path in early 2013 when one of my clients convinced me to register for the upcoming Amesbury Spartan Sprint. We gathered up a team of my clients that included 11 first timers, got pumped up about our first race, then realized it was still 4 months away and we had no idea what to expect or how to prepare! It fell to me to be their guide, so I did my homework, created workouts and programs, took them on field trips to fledgling OCR facilities, and made sure everyone stayed motivated along the way. Needless to say, the race was a blast, and even though it took us a LONG time to finish, we made sure no one got left behind and thoroughly enjoyed ourselves every step of the race. 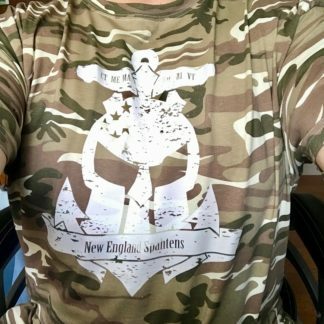 After seeing many Spahtens at Amesbury, I joined on Facebook and realized the joy and camaraderie our team had was exactly what the Spahtens were about, just on a MUCH bigger scale! Almost all races I’ve done since have been under the Spahten banner, and I’m proud to be a member of such a great team family! 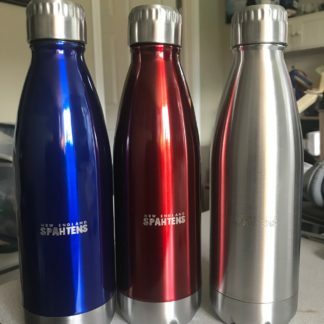 So when I was asked to help them out by being their traveling reviewer, I jumped at the opportunity to give back to the Spahten community!